Below Sarah explains how her daughter avoided surgery by turning to vision therapy. Check out their powerful story! Just after Evelyn’s third birthday, we started noticing her eye turning in. We took her to our optometrist where she received glasses. They helped for a while, but then the eye turn came back. Her optometrist increased her prescription and told us that the next step would be to send Evelyn to a specialist, which we knew meant surgery. It was difficult to think about having our daughter’s eye operated on. We prayed, acknowledging that Evelyn belonged to the Lord, but asking that if there was an alternative to surgery, that He would reveal that to us. A few weeks later, one of Evelyn’s leaders in her class at church came up to us, seemingly out of the blue, and asked us if we had ever heard of vision therapy. We hadn’t. We started doing research and found Wow Vision Therapy. What an answer to prayer it has been! I remember Evie’s first appointment and realizing that she was not seeing 3-D. It was very emotional, but not nearly as emotional as the time ten sessions later when we watched her pinch the fly wings on the 3-D vision testing tool for the first time. She was seeing in 3-D! We were in awe of His goodness to us and so very grateful! Throughout Evelyn’s vision therapy, Angela and Dr. B have both been such gifts in their work with and caring for Evelyn. 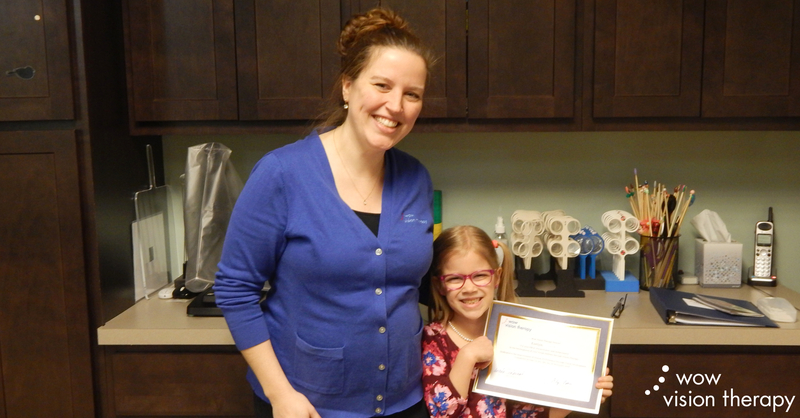 Evelyn looks forward to vision therapy each week, and watching Evie go from frustration and fear with her vision challenges to confidence and joy in conquering them has been a delight to watch. We praise the Lord that Evelyn did not have to have eye surgery and that she now sees the world in all its 3-D beauty! We are so grateful to Angela, Dr. B, and the Wow Vision Therapy Staff for their care for and work with Evie. We will miss seeing them each week and will always be grateful our paths crossed.